Downfall, a serious film about the fall of Berlin and Hitler’s insanity has been a regularly used film to mock various subjects. The latest is the denialists’ response to the record low of Arctic sea ice. Here it is, it’s very amusing and spot on when it comes to their response to a fairly hard scientific fact. Everyone who isn’t a blog scientist please leave the room ! Because that’s the level the deniers are at. how them some real science and they run a mile. 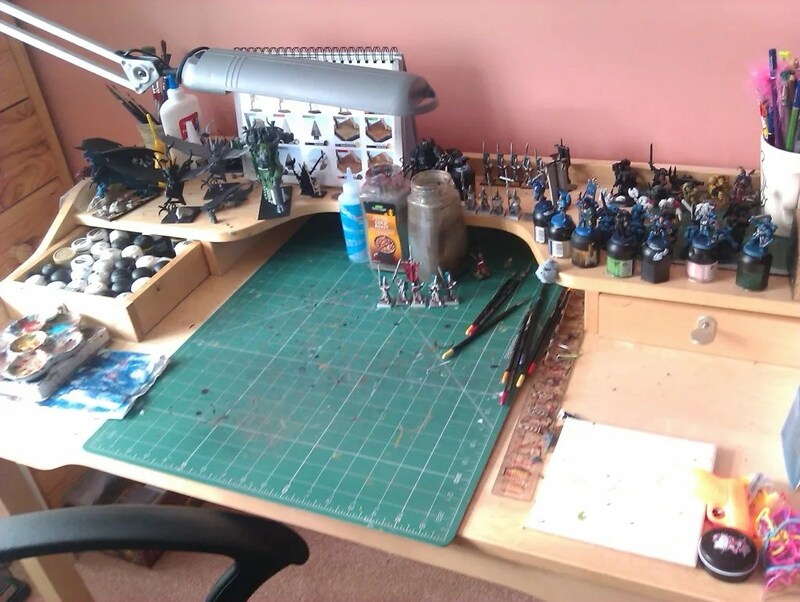 One reason for the tidy up of the Playroom (Mancave) was to enable me to use the painting table again. 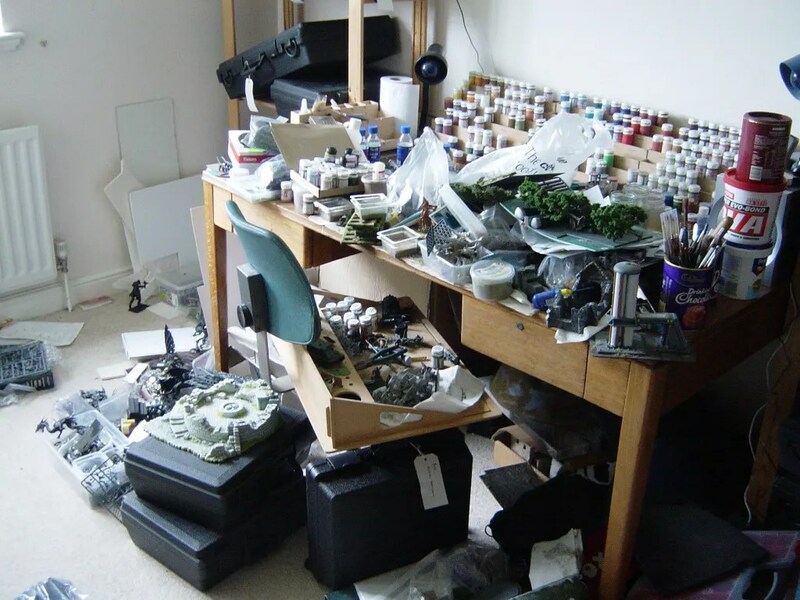 The other was to take some photos for my paint desk and add some commentary. 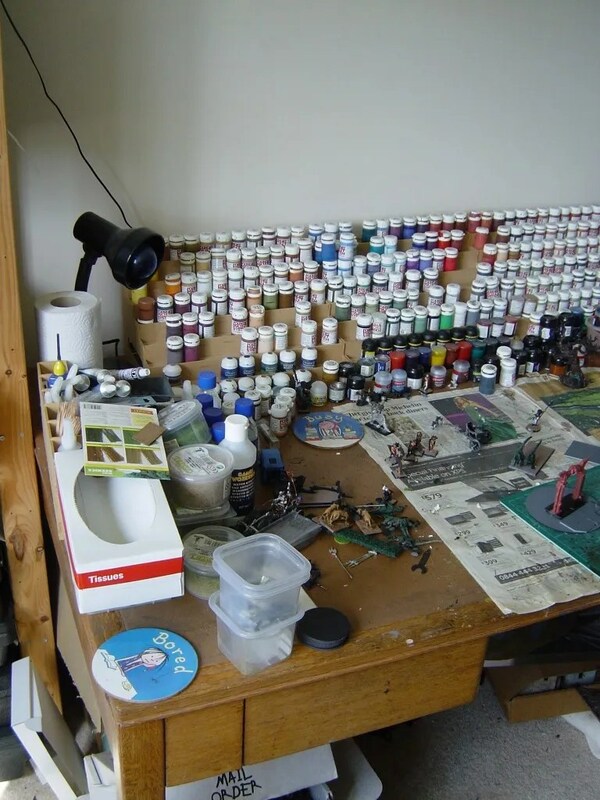 I’ve seen Rich’s painting table, and Stuart has also provided a picture of his table. What struck me was the similarity of all these tables – not immediately obvious but the structure was common in all of them. So there’s mine. A table bought from the Army & Navy store second hand – a fine place to buy military and civil service cast offs in the 1980’s and 1990’s. £15 for a 5×3 table ( I think it’s more like 5’6″ by 3’6″). Ideal for a university student to plonk his text books, notes and awesome Amstrad computer on. Served me well during uni, and has since served me well as a painting desk. Two drawers to either side for stationary and other gubbins. I’m right handed. The paint jars are to the right, one for paint, one for metallics (something Rich suggested), one for glue/PVA, and one for enamels. The first two are mixed with Revel Painta Clean. nasty stuff, it’ll melt anything, which means you can’t and shouldn’t leave your brushes in there which is why there are two sets of kitchen roll, one to soak up excess water/cleaner, to act as a sponge for when you want to to dry brushing, and a second to place your brush(s) on when you’re finished with that one. All contained in hot chocolate tubs for some reason – my late wife and various ex’s have all enjoyed hot chocolate so the containers have been put to good use. 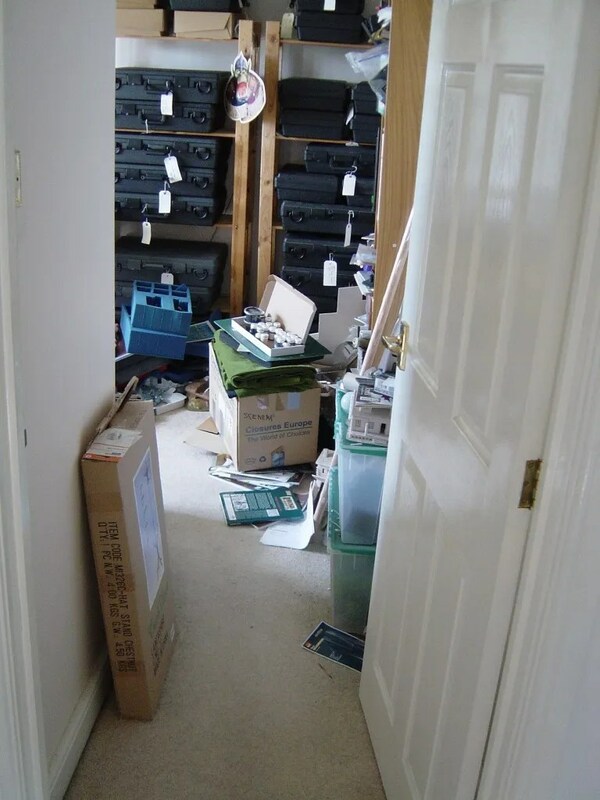 Also to the right are the iPod and Bose sound system, plus phone. Music, of which I will talk about later, is always good when painting, and having the phone in the playroom means I don’t miss many calls (yes I have an answer phone). I bought some racks for the paints, I got bored of rifling through lots of pots of paints all with white or black tops. They are very good for organising your paints so you can see them. 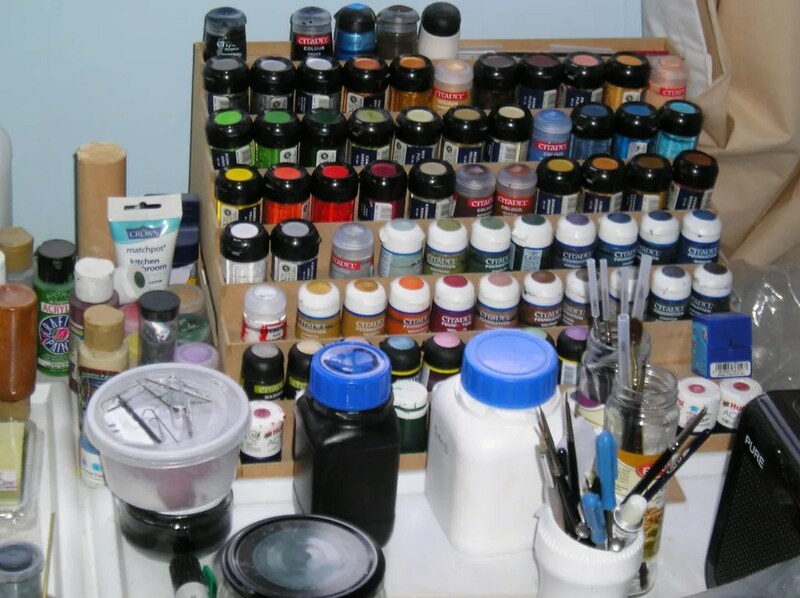 As you can see I use mainly Foundry paints, the triads so want to have them co-located, I also use GW/Citadel and others. Both sides of the desk have an angle poise lamp fitted with a daylight bulb, and the main room light bulb is also a daylight bulb. You can pick these up from DIY stores, but so far I’ve only found them at 60W. Which makes for a dim room late at night. They are useful to ensure you have proper daylight for painting at night, as ordinary bulbs radiate a yellowish light so the colours are no represented well. As a result, trying to paint anything other than base colours results in tragedy. To the left is another organiser, with my various glues, flocks, grasses and other trivia. Kitchen towel (a real necessity to clean up paint, glue and cat vomit) and box of tissues complete the table. Very similar. As a right handed chap, again we have the mixing tablet to the right, brushes mostly to the right, unusually water jar in the middle. But again a cutting mat in the middle, paints in drawers left and right, and yes, an angle poise lamp to illuminate everything. Or rather the right hand side, yup, another right handed chap ! Brushes tools and gear to the right so he can pick them up. Paints, stacked in the same style I do. And a radio. To the left, / centre again cutting mat, trays, flock and scatter foliage. Not visible is (wait for it) the angle poise lamp. 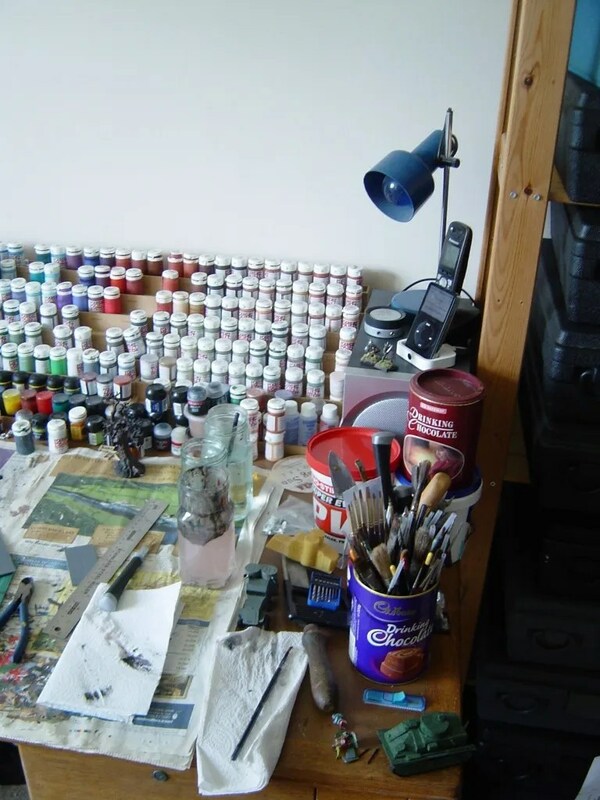 Again a profusion of random containers for flocks, glues and paints. What struck me most about all three desks, was the similarity of layout. 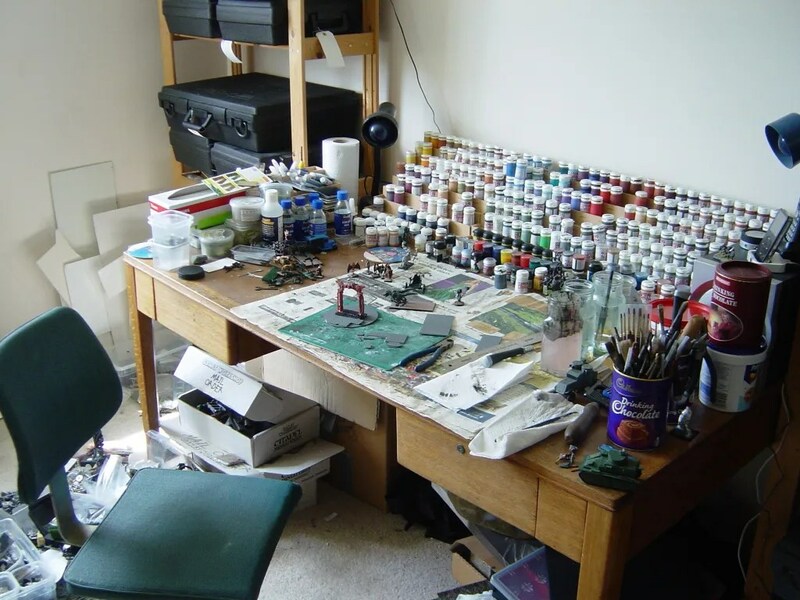 None of us have ever sat down around a table and ‘designed’ our ultimate painting desk, yet all three of us have come upm with the same layout. Whilst Rich and I are geographically close, Stuart is not. So this can’t be achieved by looking over each other’s shoulders. It can only be down to efficiency. There’s a certain list of tools and supplies, but not how you lay them out. Now there’s also something that I’ve noted. Rich and I both have radios/stereos next to their paint stations. What do we play ? Just been to see the remake of the film Total Recall. Stop reading now if you havent seen it as there are spoilers below. 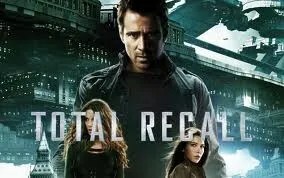 I was expecting a mildly entertaining action movie that could have been entitled “Total Remake”, but I was pleasantly surprised by it. I like the original Total Recall film, and like some of the cheesy humour it has in it. The first and obvious points to note are that the: background is totally different; and the technology is radically more advanced. However, the basic plot is there. In fact the second point is often unnoticed these days. The science fiction from pretty much the 1980’s and before has been over taken in many ways. Ok, we don’t have warp drives or stuff, but the day to day computing technology is way in advance, and the use of hand held digital phones, PDAs, tracking devices and so on are unrecognisable with yesterday’s science fiction. The background is very different – it’s not set on Mars. The colony is now the remains of Australia (Freemantle IIRC). There is a lot of back story that doesn’t get a lot of air time and I’d hope any DVD pack would fill us in on some of this, but it basically seems a series of NBC wars have rendered habitable areas limited. So there is a struggle between the United Federation of Britain, and the Colony with Quaid/Hauser the double agent which matches the first film. 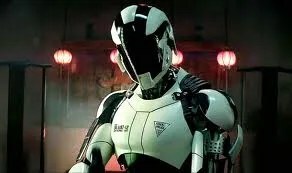 There was at least one blatant hat tip to the original film, which I won’t spoil for you, but did make me want to laugh, and the high proportion of Asiatic culture was also a h/t to both Blade Runner and Firefly, but also a healthy dose of Russian/East European culture as well. The SFX were good, and whilst some of the protracted sequences were a bit wearing, they were interspersed with a goodly dose of scenes driven by dialogue and proper acting (Bill Nighy criminally under used). There were only a couple of points when I wanted to slap the main protagonists[*] – NO YOU DO NOT WAIT TO HAVE A SMOOCH AT THE END OF A NEAR ESCAPE WHEN THE EVIL PERSON IS WATCHING YOU AND CAN PROBABLY SHOOT YOU. Quite by co-incidence today’s Torygraph has a good article about how Hollywood’s obsession with SFX is detrimental to the overall film making experience. I prefer films with good dialogue, a decent plausible plot, good acting over and above a violent adrenaline rush of chases and explosions. This is why I like films like The Big Sleep, Schindlers List and so on that contain few if any action scenes and/or SFX. Minor annoyance, the evil troops are ‘synthetics’…robots…and bear more than a passing resemblance to Star Wars’ Stormtroopers. I think we’ve moved on a bit from there. This remake I think was a good one – not the best – but certainly worthy of lasting attention. I may be wrong, but I think I’ll get the DVD for further watching if I can’t catch it in the cinema again. Thinking about it, its like comparing the original series of BSG, with the remake. Each has its +/-s, each is unique, and each is enjoyable for those reasons. One thing that did shock me though, and it has nothing to do with the film, was the large number of clearly under-age children in the cinema. This is not a gross out film by any means (sexually, linguistically or in terms of violence), but it really is not suitable for kids who looked no more than 8. [*] Whereas within 15 minutes of watching Speilberg/Cruise’s remake of “War of the Worlds” I wanted the entire family to die very very quickly. Painfully. The playroom got out of hand, and started spilling out onto the landing. 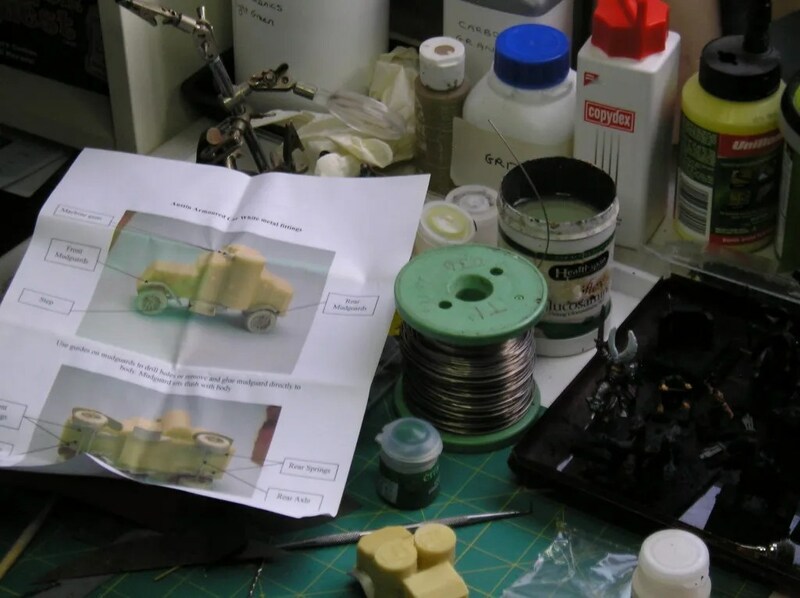 The piles of miniature cases started spreading, and I’m sure the figures started multiplying in the piles of spare foam, random boxes, and piles of components. The cats were no longer prepared to go in there even out of curiosity, none of them had gone missing but it was only time…. Finally, when I couldn’t find some of my modelling tools, I knew I had to strike. The painting desk is unusable. But I found my model of Amun Sul. I had painted it for the first of our Xmashammer games (two days), but only to a basic standard. So I’ll doe a project to add static grass, vines, leaves and the inevitable devlan mud wash to jazzn it up, and use it again in battles. More to follow on this. 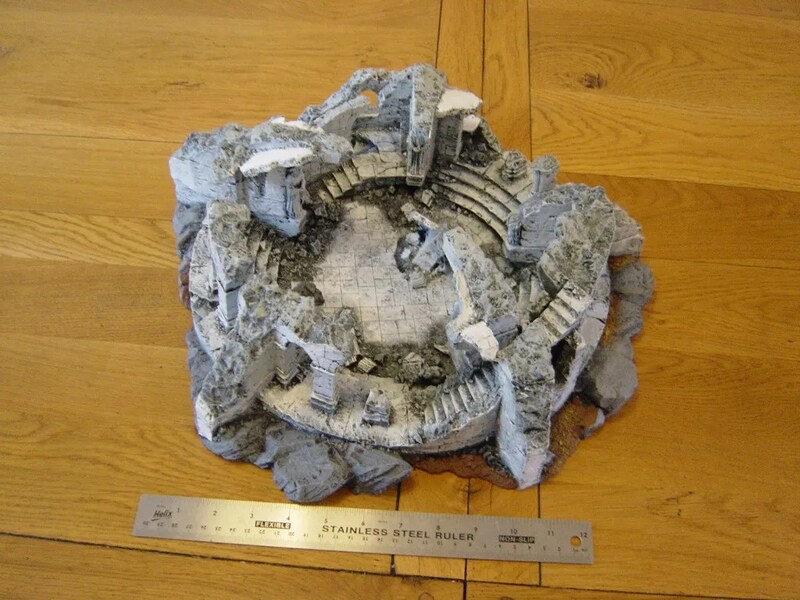 Its the LE resin piece Forgworld did a few years back. And its big, that’s a 12 inch ruler by it ! Not appearing in the happy happy joy joy MSM anywhere prominently because they’re transfixed by the scandal of seeing a males’ anatomy, is the record Arctic ice melt this year. 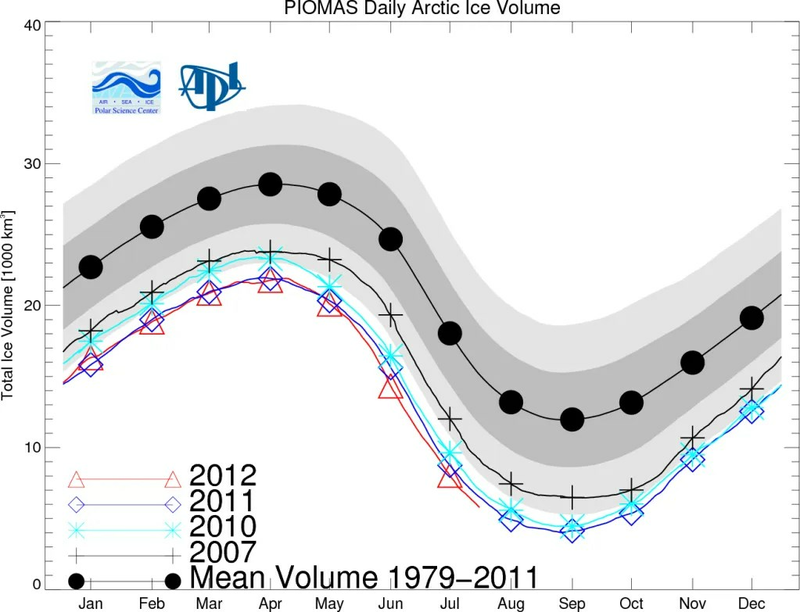 Yup, the Arctic ice extent is set to break new record lows. The scientific literature shows that arctic ice melt is the canary in the mine. 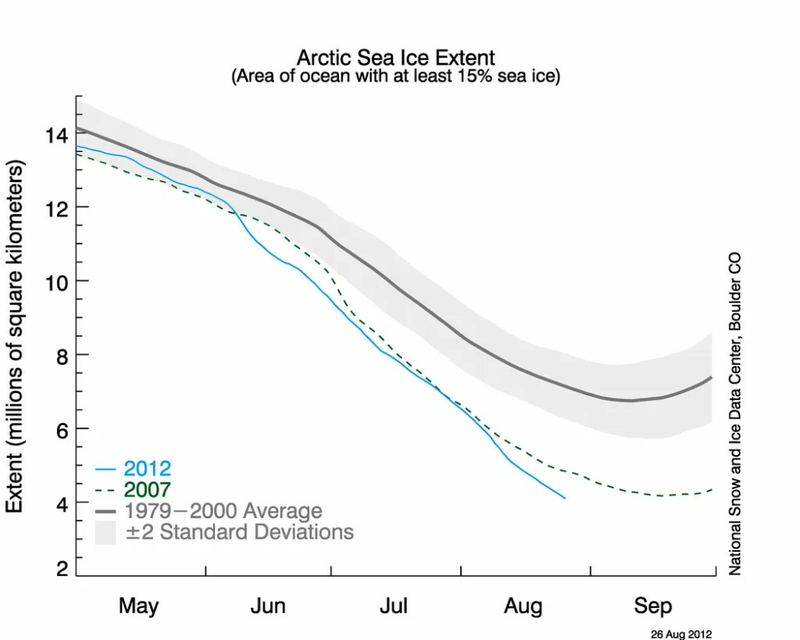 Ice extent, on its own isn’t a very good measure of what’s happening to the Arctic ice cover. You have to consider the volume of the ice. Pull the other one, it has bells on. The Arctic is melting and the anthropogenic CO2 is the major culprit. And the ice keeps melting because we have several more weeks of the ice melt season. Ok so a three thousand point army each side. Byakhee Anthony after retrieving his army list after (he turned up without army list and army book) laid into me and gave me a damn good thrashing. 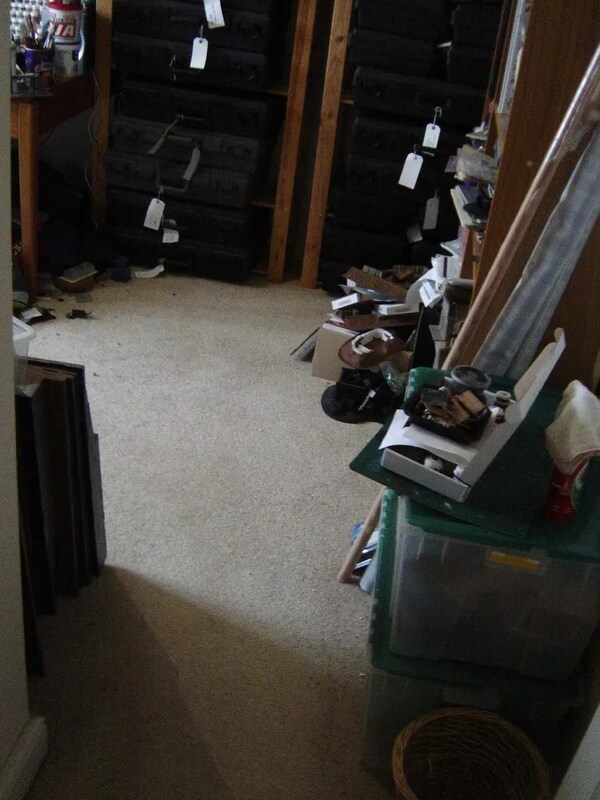 Rich, as the neutral obsever, arrived somewhat later than originally planned due to illness and being out until 3am…. 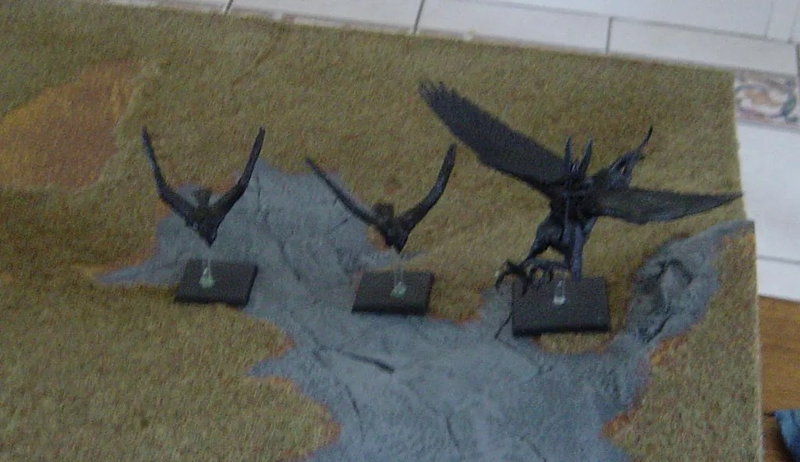 Obviously not as simple as that but they’re the deciding factors in the first few turns of the battle. Also, you’re suffering from playing an army against someone who has mastered it. So he can predict what sort of army you will use, counter your tactics knowing the ins and outs of the army. Psychology – totally different army. 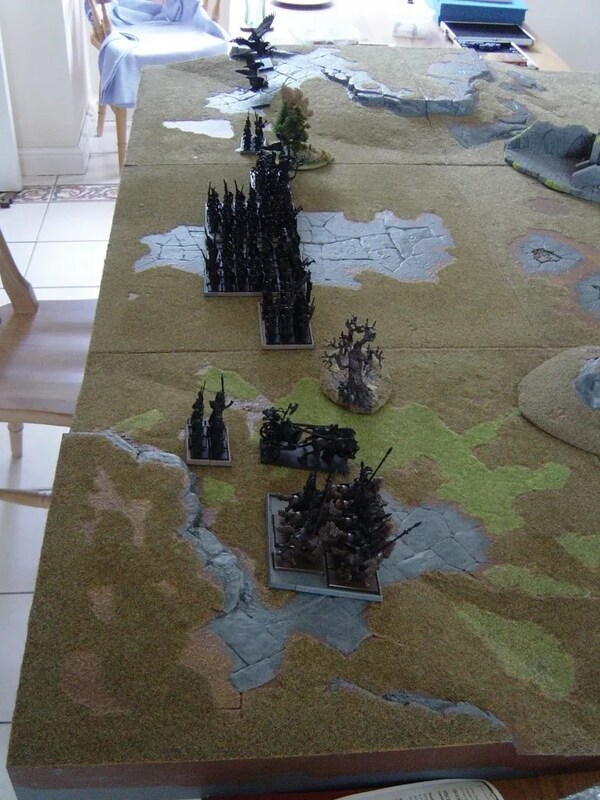 Dark Elves move fast and are able to react. And also there is a whole phase of the game that Dwarves don’t take part in [Magic] that’s a different thing. Doing something like this, the battle reports like this, capturing different view points, is more useful and interesting than reading a blow by blow account. I hope. I’d have liked to put my favourite skirmishers (Shadow Warriors) in for this battle, but couldn’t justify their points cost. They would just get in the way of the idea of a very rapid attack, really. How to get at the dwarf artillery? A flying attack force on one flank, and heavy cavalry (8 Dragon Princes, that’s very heavy cavalry! R ) with a heavy (Lion) chariot in support on the other flank. 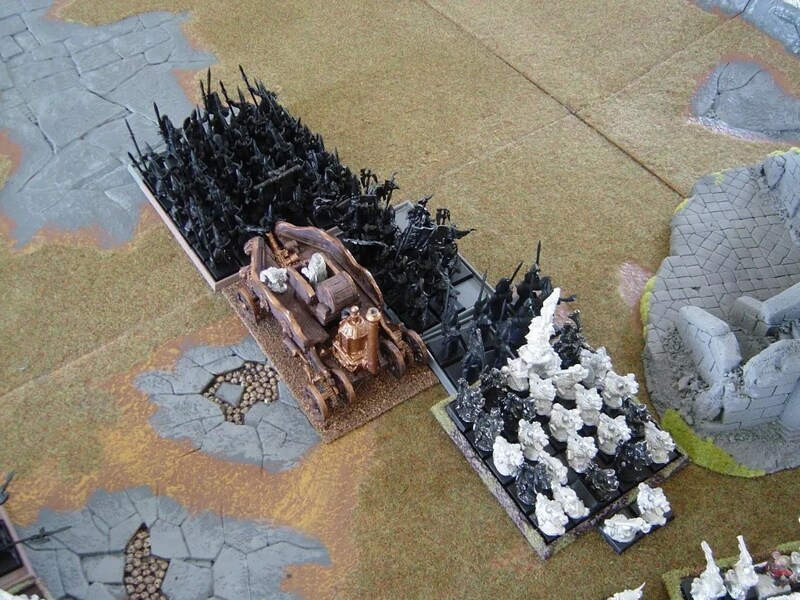 How to protect the flanks of the big spearmen units? With elite units (Phoenix Guard and White Lions) on either side. And then two small (8) units of Swordmasters to respond as needed. On the dwarf counter charge (into the flank of the swordmasters) the swordmasters held their own, actually out-killing the hammererers (who had rubber mallets) and allowing me to finsih of the Juggernaut and reform before taking on the Hammererers, which resulted in a crushing victory! 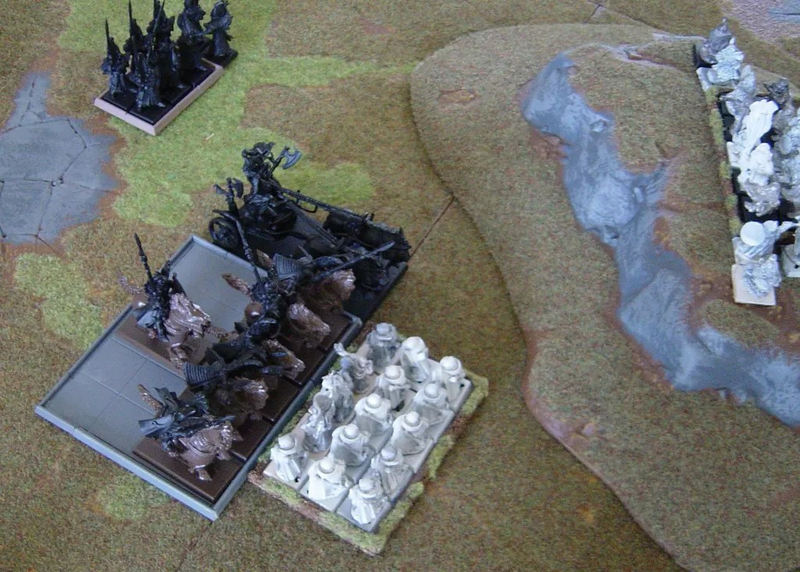 Overall, the strategy of going with a fast moving army concentrating on combat rather than magic or shooting paid off. I expected at least some token shooting and much more magic. 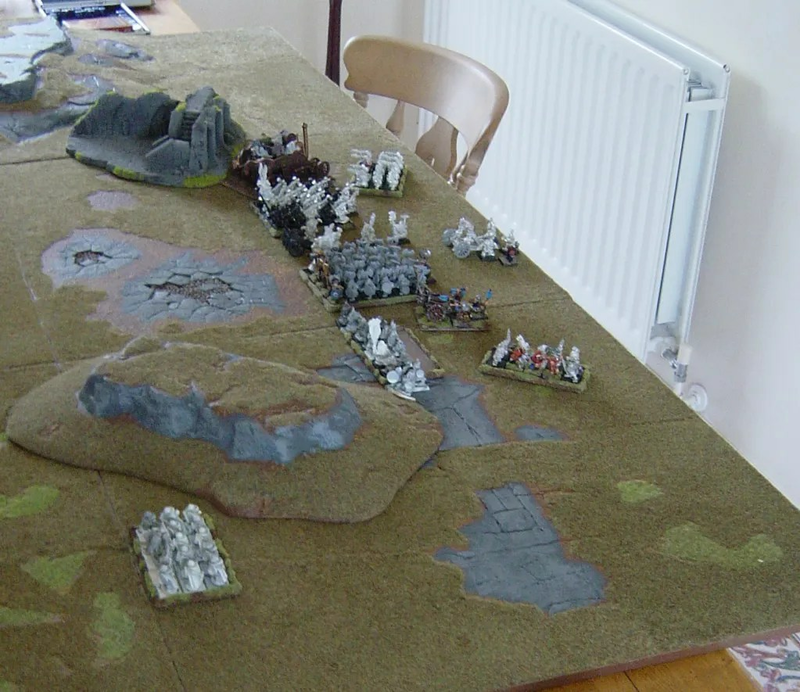 One of the features of how we play WHFB here is that we all collect BIG armies, so we can field entirely different forces from game to game, and this battle was a good example of how that can catch out your opponent. On top of this, I fouled up my deployment spectacularly, and then didn’t react quick enough – not that Dwarves really can. I hadn’t realsied the flaning cavalry were Dragon Princes, so the poor Rangers were destroyed instantly, and the Thunderers were dumb and sat there with no field of fire. I deployed the Juggernaut for the first time, and got obsessed with it – I knew/know its no battle winner, but got carried away charging away unsupported at the enemy. I then got unlucky, rolling a misfire for the Juggernaut, AND next roll having a second misfire for the organ gun. It all ended in a predictable bloody mess. Also typically my DWarf Lord, also seems to have been to the School for Dark Elf Assassins, and having hit 3 times on the Swordmasters, managed to roll THREE ONES to wound. Those three wounds might have made a big difference. Still I did at least annihalte one of the High Elf Spearmen units (40 each inc hero). I think I’d learnt from some of Anthony’s tactics with flanking units, only he was one step ahead of me and knew what I’d do as Rich comments earlier. back to the drawing board/spreadsheet. Still, I got to field the Dwarf Juggernaut, so there ! These are the pictures and basic flow of the battle, more commentary to follow. 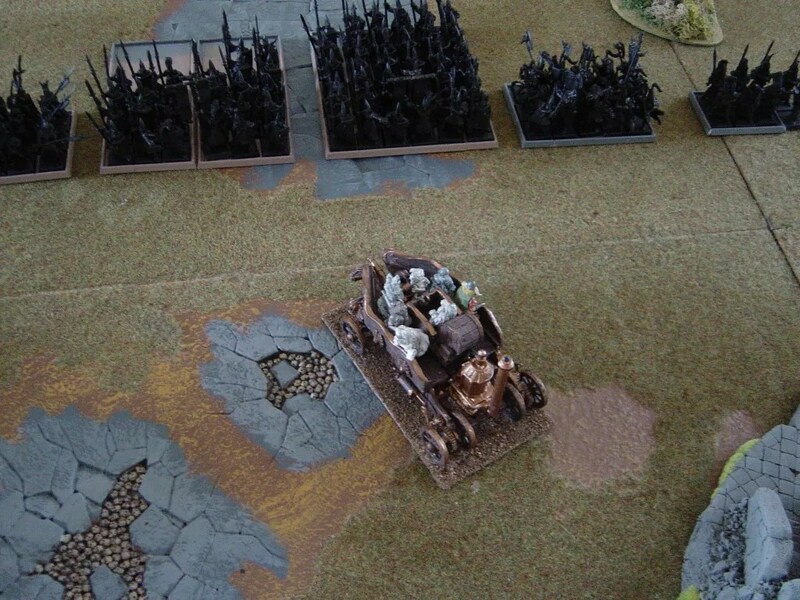 The Dragon princes charge, as does the Lion Chariot – a basic error on my intel – I thought they might have been Silver Helms at best (‘bye, see you guys). A poor shooting round did not help, even if the charge response (stand and shoot) was good). (On the upside for me, the swordmasters top left in that picture were shot by the Quarrellerers on the hill, and failed 3 LD tests and ran off the board !). 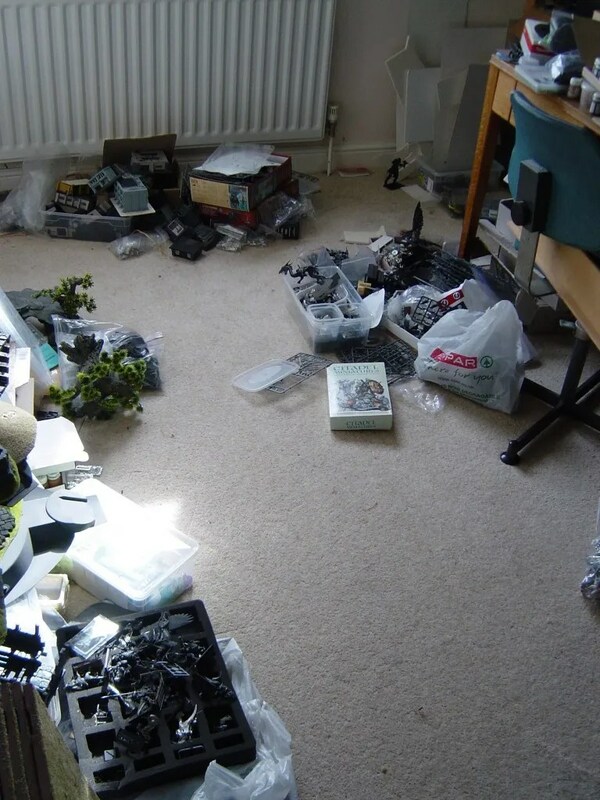 Oh dear, look where we ended up when the Juggernaut rolled a misfire roll on the dice, and all its systems went down – no move, no gun, no valves…yup slap bang in front of the entire HE army line. Obviously, 60+ HE charged into close combat. Yes, that’s 40 Spearmen, 15 White Knights, and 8 Swordmasters, each with their heroes in tow…As expected the spearmen did no damage but the GW wielding flank attacking Swordmasters and White Knights did ! We concluded that the Juggernaut rules are not over powered. 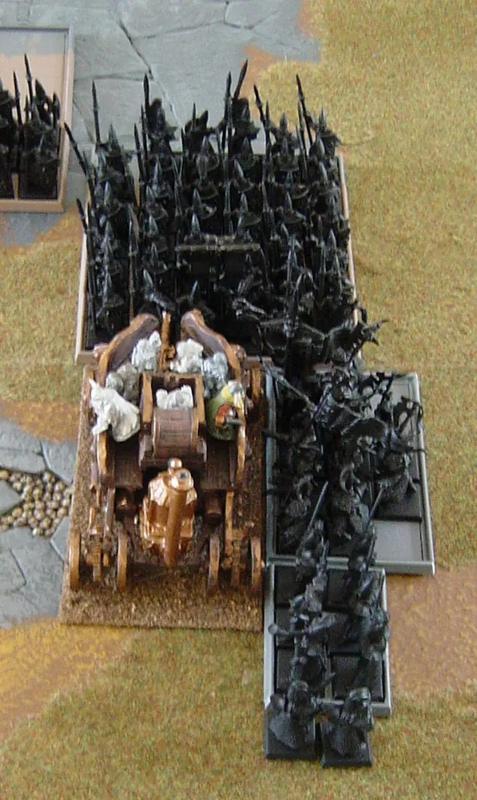 In the mean time, the Dragon princes and Chariot has flanked and attacked the war machines, with the Dwarf warriors charging into the Phoenix Guard in a meat grinder style. 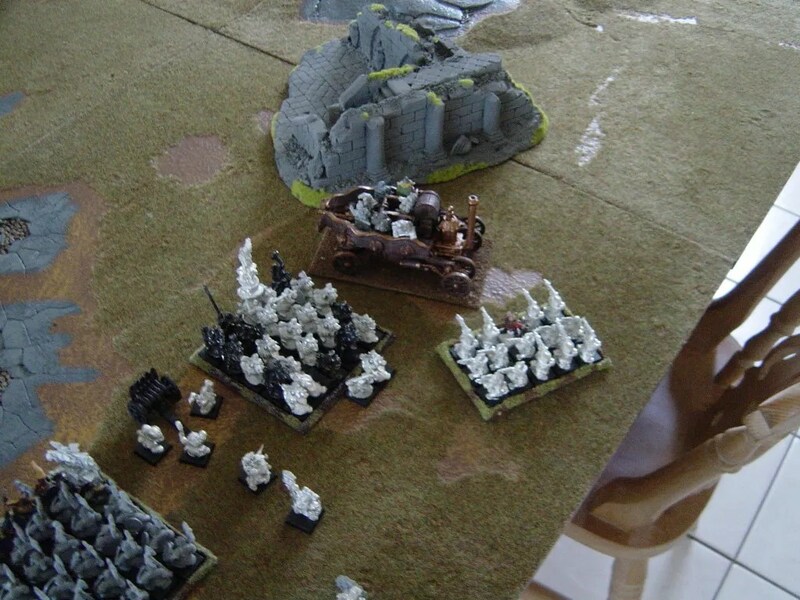 The second unit of HE Spears were annihilated by the organ gun after it had received 3 hits from the grudge thrower. 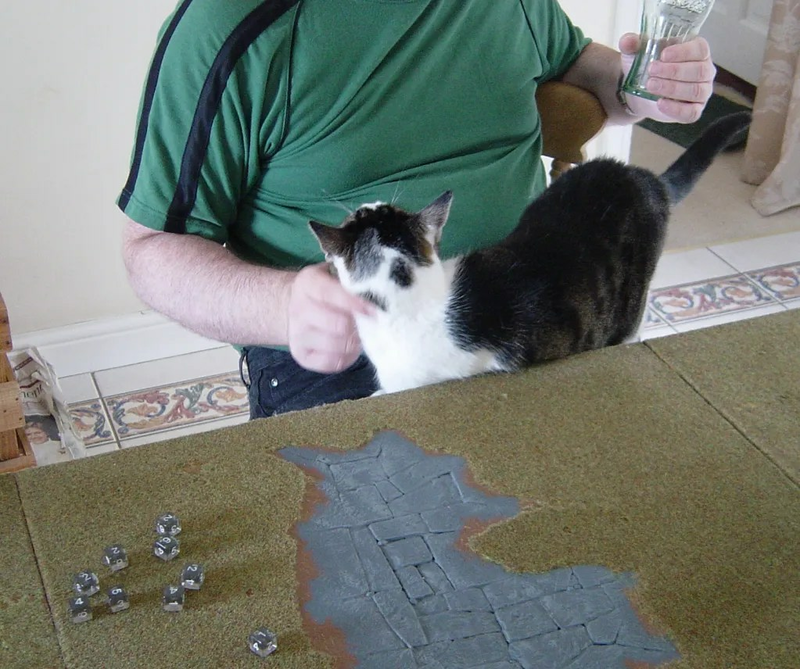 Anthony sat down, and Clawed’s skill at “Detect naked lap at 100 paces” kicked in, and he moved in to cover up this naked lap with furry cat meat ! !